Located behind the Asian Civilisation Museum is the old Parliament House. 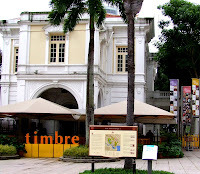 It is now a restaurant called the Timbre. And standing to its right, looking into the photo, is where the statue of Stamford Raffles now stood. Look at his folded arms. And behind him, across the rivers, are the skyscrapers of big financial institutions. The towering block acting as a backdrop to Raffles is one of two towers of UOB. 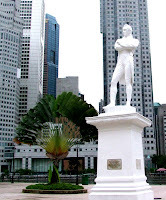 It is claimed that the present site where Raffles stood was where he first landed on the islandin 1819. And the surrounding area was claimed for his government offices.